As the Panama Papers are rolled out, many are wondering how they connect to the Panama Free Trade Agreement, technically called the Panama United States Trade Promotion Agreement. It is far too soon to know what exactly the content, meanings, implications, and ramifications of the Panama Papers are. What we can say with certainty, however, is that trade agreements are not all about trade. At least not in the sense that most of us think when we hear the word “trade”. For example, in everyday life I might trade you a batch of homemade cookies for your help with my computer. So we apply that concept to trade at the national level. Mexico provides the United States with tequila and we provide Mexico with Jack Daniels. Americans get margaritas; Mexicans get whiskey sours. Seems like a win-win, right? It is just not that simple. Free trade is about the rich getting richer and the poor getting poorer. It is about the displacement of peoples and about the offshoring of both jobs and national sovereignty. It is about creating “investor state treaties” with extra-national legally binding means to protect corporations and their investors from such things as local environmental protections. As the Panama Papers seem destined to prove, they also are about offshoring the profits via tax havens which should have been turned into taxes to benefit the rest of us. As we learned with the North American Free Trade Agreement, what was really going on was what was called the “opening of markets”. How does the US’s Archer Daniels Midland [ADM], for example, a heavily subsidized, gargantuan producer of factory farmed corn, open up a market in Mexico? By taking the market away from Mexico’s often indigenous “people of the corn”. As you can see in this video, corn is a staple of the Mexican diet, Mexican culture, and the peasant Mexican economy. There was no shortage of people wanting to produce corn in Mexico. So, to open up that market, the tariffs that ADM had to pay to export its corn to Mexico, were removed. That means that by removing the tariffs, protections for the indigenous Mexican farmer, ADM was put into direct competition with peasant farmers in Mexico’s heavily indigenous, southern state of Chiapas, for example. This is what made the trade “free”. It was unobstructed by tariffs. But, there was more to it than that. As a prerequisite for Mexico being able to enter into the NAFTA, it had to remove the subsidies it had long provided it’s peasant corn farmers, subsidies which had helped them stay on their lands and maintain their economy and their culture. However, subsidies paid to US factory producers of corn were not removed. Instead, subsidies to them increased. According to the Environmental Working Group Farm Subsidies Database, between 2005 and 2012 US factory corn producers received $84.4 billion in subsidies. In a simplified nutshell, NAFTA created about 10 Mexican billionaires while it pushed 1 1/2 to 2 million peasant farmers off their lands and into migration including illegal immigration into the US. NAFTA also was about the offshoring of good paying jobs in the United States. It, along with previous agreements, created a “maquiladora” zone in Mexico which took advantage of displaced farmers and others. Maquiladoras, or “maquilas” as they are often known, are factories. They are owned by US companies, for example, which export their parts and equipment for assembly, processing, or manufacturing in Mexico. The parts and equipment are exported without the paying of tariffs. The product is made by Mexican workers often making no more than $5.00 a day and with very little in the way of safety regulations or recompense for injuries sustained on the job. The products then are exported back to the US, tariff free, and sold to consumers at artificially low prices. Of course, there had been Americans making those products before and often had received good pay and benefits. Those jobs were taken from them; they did not walk away from them. It does not take a Ph.D. in economics to understand what was going on. The rich were made richer and the poor were made poorer. My film, The Second Cooler, helps explain the relationship between NAFTA, the displacement of indigenous peasant farmers in Mexico, and the offshoring of US jobs. NAFTA and other free trade agreements, or FTAs, were also about the offshoring of national sovereignty. The offshoring of national sovereignty is not unprecedented. The International Court of Justice, also known as the World Court, was established in 1945 in The Hague, to settle legal disputes submitted to it by member states. It was in the World Court, for example, that Nicaragua successfully sued the United States over the bombing of its harbors and buzzing of its cities during the Reagan sponsored Contra counter-revolution. The International Criminal Court, established in 2002, created an international jurisdiction and a means by which individuals could be prosecuted for such crimes as genocide, crimes against humanity, and war crimes. Both these agencies were formed to protect nations and peoples. But NAFTA and other FTAs, including the Trans-Pacific Partnership offshored national sovereignty in a new way and with a new purpose: the protection of investors and corporations. It is for this reason that NAFTA is often said to be an “investor state treaty”. It is not just about tariffs, subsidies, and the movement of traded materials and products. 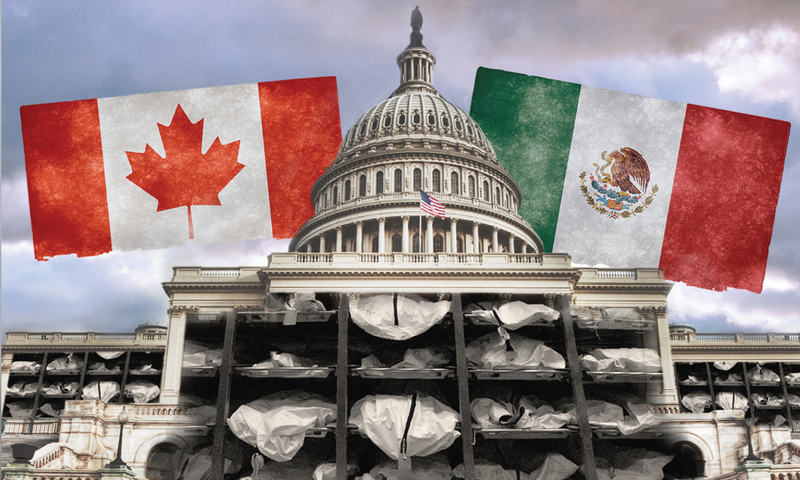 It is about the creation of an international court system which transfers sovereignty from local, state, and national governments to a NAFTA panel of decision makers when legal disputes arise. Chapter 11 of NAFTA describes a means for “investor state dispute settlement”. It allows corporations to sue the United States, Mexico, or Canada, the NAFTA member states, for compensation when actions by their governments damage their sales or profits. Several Canadian groups have challenged the constitutionality of Chapter 11, but lost at the trial level. For example, Methanex, a Canadian corporation, filed a US $ 970 million suit against the US. It claimed that a California ban on Methyl tert-butyl ether [MTBE], which had gotten into California’s wells, had hurt Methanex’s sales of methanol. In this case, the NAFTA panel found in favor of the US and Canada had to pay court costs. But in another case, Mexico had to pay Metaclad, a California based US corporation, $15.6 million after a Mexican municipality refused a construction permit for a hazardous waste landfill Metaclad wanted to construct in San Luis Potosí. In Metaclad Corp. v. United States, the NAFTA panel ruled that the municipality of San Luis Potosí did not have the authority to ban construction on the basis of environmental concerns. Apotex, a Canadian pharmaceutical company, is suing the US for $520 million because it says that a Food and Drug Administration generic drug decision harmed its “opportunity” at sales and profits. Lone Pine Resources, Inc., which is incorporated in Delaware but headquartered in Calgary, Canada, is an oil and gas exploration, development, and production company. It has filed a US $250 million claim against Canada because Canada wants to prevent fracking exploration under the St. Lawrence Seaway. The lawyer for Lone Pine Resources accurately refers to NAFTA as an “investor protection treaty”. The World Trade Organization [WTO] was organized in 1995 — 3 years after the signing of NAFTA and months after NAFTA began to be implemented in 1994. There are 162 member states. It provides a framework for negotiating further trade agreements and a means by which disputes can be resolved. The aim of the WTO is to enforce participants’ adherence to WTO agreements. The Panama Free Trade Agreement, which President Obama signed in 2011, not only was about eliminating tariffs and about consolidating access to goods and services. It was about favoring private investment in and between the United States and Panama. I won’t pretend to have looked at the Panama Agreement as closely as I have the NAFTA and CAFTA agreements. But my research has yielded this: in addition to trade and other economic issues, it had to do with intellectual property, labor, and environmental policies, among others. Among the primary criticisms of the agreement, for example, has been its effect on copyright laws which have served to infringe upon free speech. Again, what we are seeing is about much more than trade. The Trans-Pacific Partnership [TPP] is now creating a new “investor state system”. The signatory nations are the United States, Peru, Chile, Vietnam, Brunei, Malaysia, Singapore, Australia, and New Zealand. This is the agreement which President Obama has promoted and for which he received “fast track” authorization. That means the ability to negotiate in secret. Lori Wallach of Public Citizen’s Global Trade Watch, has described the TPP as “NAFTA on steroids” and a “corporate Trojan Horse”. You can listen to an interview by Amy Goodman with her for Democracy Now! here. Wallach, Gretchen Morgenson, and other trade policy analysts emphasize that these trade deals have less to do with trade than with the offshoring of national sovereignty to international corporations. One of the primary concerns has to do with the erosion of the right of the US Congress and state legislatures to enact public interest policies prohibited in these pacts. If the TPP goes into effect, existing agreements like NAFTA will be reduced, they say, to those provisions which do not conflict with the TPP. As with NAFTA and other trade agreements, the TPP would create an extra-national judicial system designed to protect corporations and their investors. It would give them the right to attack US financial regulations in front of tribunals composed of three private sector attorneys. Those attorneys would operate under World Bank and United Nations rules of arbitration. In other words, the “investor state system” with its own judicial apparatus allows corporations to bypass US courts and laws and to sue American governments for money damages over any regulatory efforts the corporations say undermine not only their current profits but their “expected future profits”. Among the TPP nations, there already are cross-registered 11,933 corporations. Here are a two examples of what already is happening. Chevron is using an “investor state” tribunal to try to avoid paying $18 billion — that’s billion — to clean up contamination is caused to the Amazon River. This fine was ordered after 18 years of litigation and rulings in courts in Ecuador and the US. Philip Morris is using it to attack Australian and Uruguayan plain packaging laws for cigarettes. Already governments have paid more than $675 million to corporations under these “investor state” provisions. Seventy percent of them have been for non-trade policies including environmental and health policies. You don’t have to have a Ph.D. in economics to understand who the primary beneficiaries of this system are. You don’t have to have a JD [Juris Doctorate] to figure out how difficult it could become for state and nations to have the legal ability to enforce environmental, financial, and other public interest regulations. I, for one, am waiting to see exactly what all the Panama Papers will reveal. It seems apparent they will reveal an insatiable appetite among the wealthiest of the wealthy for ever more wealth at the expense of the 99%. They also will reveal a clear connection, if my prediction is correct, to free trade agreements and the the offshoring of national sovereignty to a global “investor state” which protects the interests of the globalized 1% class and which makes it legally difficult to do anything about it.